But to some county residents, the issue was no joke. Two years later, South Arlington residents George Vollin Jr. and Harrison Douglas sued the county board unsuccessfully, charging that its at-large system of governance resulted in a geographic imbalance and de facto discrimination against African-American voters, most of whom lived in the southern part of the county. Shifting to a district system, they argued, would allow for more equitable, county-wide representation on policy matters and funding decisions. Fast-forward to 2015, and accusations of geographic bias still invariably creep into deliberations over county spending—whether the issue on the table is a proposed streetcar project, an aquatics facility or a potential solution to school crowding. When did all of this acrimony begin? And is northern favoritism a reality, or merely a lingering perception? Geographically speaking, Arlington is, indeed, split in two. The division was codified in 1932 when the county adopted a new street-naming system to make street navigation more logical for emergency responders and postal workers. Under the system, Arlington Boulevard (U.S. Route 50) forms a dividing line between the county’s northern and southern halves. Numbered streets then run from east to west, parallel to Route 50, while named streets run from north to south. But the county’s present-day tensions over latitude didn’t start with the street-naming system. History suggests that certain cultural and economic disparities existed well before street addresses were amended to include the words “North” and “South.” And their legacies may yet be feeding into modern-day perceptions of territorial fairness. The term “North Arlington” actually predates the county’s given name. In the late 1800s, when Arlington was still a rural part of Alexandria County (it didn’t become Arlington County until 1920), the society pages of The Washington Post made reference to a country estate owned by Robert A. Phillips, a home called “North Arlington” in what is now the Dover-Crystal neighborhood north of Nellie Custis Drive and Military Road. (Most of the property is now Riverwood.) Though the origins of the property’s name are unclear, it may have been a nod to its coordinates in relation to Arlington House, the plantation home of Mary Anna Custis Lee and Robert E. Lee, which later became the centerpiece of Arlington National Cemetery. At the same time, racial segregation played into early perceptions of a north-south divide. During the Civil War, the federal government created Freedman’s Village, a settlement for emancipated slaves on a portion of the former Custis-Lee estate, and its population soon swelled to several thousand. When the government disbanded the village in 1900, many of its inhabitants went on to form Arlington’s historically African-American neighborhoods, including Green Valley (now Nauck), Johnson’s Hill (now Arlington View) and Butler Holmes (now Penrose) in the areas around Columbia Pike. Throughout the early 20th century, most of the county’s black residents continued to live south of what is now Arlington Boulevard, where, according to Census data, many of the men worked in the brickyards of Alexandria, drove coal trucks or did other manual labor, while women worked in laundries or as maids. The north, meanwhile, was a land of doctors, lawyers, real estate investors, business tycoons and old money. And it was almost exclusively white, with the exception of one black neighborhood—High View Park-Hall’s Hill, which straddles Lee Highway a few blocks west of the intersection with Glebe Road—many of whose residents worked as servants in white homes, or as farmhands on nearby estates. Even after the abolishment of Jim Crow laws and the 1968 adoption of the Fair Housing Act, the economics of race continued to exert a lasting impact on real estate values in Arlington—a phenomenon that was often brought into sharp focus by geography. And though the demographics of that area continue to change—Nauck, the African-American enclave that was once home to medical pioneer Charles Drew, is now one of Arlington’s most ethnically diverse neighborhoods—the discrepancies in housing prices have not. Last year, the average home sale in Nauck, just south of Columbia Pike, was $417,592, according to the real estate listing service MRIS. By comparison, the average home sale in Lyon Village, which sits due north of Clarendon, and where covenants once forbade the sale or lease of homes “to anyone not of the Caucasian race,” was $1.5 million. There are, of course, exceptions. In 2014, average home prices in South Arlington’s Arlington Ridge neighborhood—a topographical high point that enjoys enviable views and close proximity to Washington, D.C.—topped $1 million, according to MRIS. But a broader view of the county landscape shows some lingering disparities. The average price of an Arlington home north of Route 50 (including single-family homes, townhomes and condos) in 2014 was $737,000, compared with an average of $453,000 in South Arlington, according to numbers provided by Paul Cachion, a real estate agent with Long & Foster in Arlington. “It’s pretty dramatic,” he says. Economic differences are also evident in South Arlington schools such as Carlin Springs and Randolph Elementary, where 80 percent of students qualify for free or reduced-price lunches. By comparison, less than 5 percent of students at Jamestown, Nottingham and Taylor (all located in the north) qualify for this government benefit, according to Arlington Public Schools (APS). Another uncomfortable reality feeding into the equation is community engagement, which some observers say is more pervasive in the county’s northern neighborhoods. There is a perception that municipal problems get taken care of faster on the “north side,” says Alfred Taylor Jr., a lifelong resident of Nauck (his father was a county employee for four decades) who served as president of his neighborhood civic association from 2001 to 2006, and again from 2011 to 2014. But northern residents may also be more likely to call and report issues. Generally speaking, northerners tend to be squeakier wheels, says John Antonelli, who has served on the Arlington County Community Services Board, the County Housing Commission and held other posts. “They are much more politically savvy [in the north] than most South Arlington families,” says the government analyst, who lives in Douglas Park near Columbia Pike. But time is also an issue. “If you’re working three jobs, you don’t have time to go to PTA meetings” or to petition the county board when you’re unhappy with its plans, Antonelli says. Residents who are non-native speakers also are less likely to write letters to elected officials or speak up in community forums. Alfred Taylor Jr., recent past president of the Nauck Civic Association, stresses unity over geographic partisanship. Photo by Michael Ventura. Historically, North Arlington residents have been more likely to mobilize NIMBY (not-in-my-back-yard) protests against proposals they disagree with. Consequently, South Arlington has been saddled with “the things that nobody wants,” Antontelli contends. As examples, he cites a detox and rehabilitation center on Columbia Pike, and the county’s Department of Human Services, which is in the process of moving all of its operations from Clarendon to the county’s Sequoia Plaza just south of Route 50. To be fair, North Arlington is also home to a few county facilities that are less than bucolic. Among them: a salt dome, a leaf mulch site and a water tower in the Old Dominion neighborhood. Nevertheless, the perception of geographic unfairness can be hard for county officials to overcome. Especially when they are operating in the wake of decades-old animosities—like the ones that former county board chairman John Purdy cemented in 1975 in an op-ed letter to The Washington Post, which he penned in response to citizen complaints about an existing incinerator (used to burn sludge) and an expanding sewage plant off of South Glebe Road. That, in turn, prompted responses from a number of South Arlington residents, including John Marr, then president of the Arlington Ridge Civic Association (whose neighborhood overlooks the sewage plant), Emmy Lou Runyan and Sherman Pratt. Together, they outlined a litany of concerns, from the sewage plant and sludge-burning to the dominance of I-395 and other highways in the South Arlington landscape. Why was it that in North Arlington, citizen complaints had resulted in Route I-66 being pushed below grade and downscaled to occupy a smaller footprint, whereas public concerns over highway traffic and environmental blight in South Arlington seemed to be falling on deaf ears, they wondered? Similar questions are still being asked today. Though Wakefield High School—the only Arlington public high school south of Route 50—was recently renovated to the tune of $118.6 million, the project was third in line after Washington-Lee (renovated in 2009 for $99.4 million) and Yorktown (which reopened in 2013 after a three-phase, $84.1 million remodel). Some residents viewed the pecking order as evidence of a northern bias, although Arlington County Board Chair Mary Hynes insists that when the buildings were being evaluated, Wakefield appeared to be in the best shape of the three. Only after construction was underway was it discovered that the original Wakefield building had mold issues. Tensions were again ignited in January when APS announced Thomas Jefferson Middle School and Community Center (TJ) as a potential location for a new elementary school building to alleviate overcrowding. One site solution would have encroached on the park and athletic field next to the school, taking a bite out of neighborhood green space. The timing of the announcement came just as the county also began looking into an expansion of Benjamin Banneker Park, near North Sycamore Street in North Arlington, Antonelli points out. Though the proposal for TJ has since been amended (the revised plan does not compromise green space, but instead confines most of the construction to an existing surface parking lot), the county board has asked APS to look at other options. Hynes acknowledges that the final decision, whatever it may be, is bound to leave some citizens unhappy. Sometimes the best decision for the county as a whole is not in the best interests of a single neighborhood or a smaller subset of residents, adds John Milliken, who was recently appointed chair of the Arlington Community Facilities Study Task Force, a group formed in January to make recommendations regarding the future placement of schools, fire stations, vehicle storage and other county services. A resident of Arlington Ridge, Milliken is now charged with creating a 20-year “resource strategic plan” that is geographically agnostic. “I think the criteria should apply countywide,” says Milliken, who is no stranger to controversy. He served on the Arlington County Board in the 1980s, during a time when political tensions were high over the development of the Rosslyn-Ballston Metro corridor and its effects on adjacent neighborhoods. There is a certain pride of place in South Arlington today. A line of T-shirts and hoodies, created by Wakefield High School alum Ryan Fountain, bears images of well-known landmarks, intersections and neighborhoods, from Shirlington to Green Valley, with the words “South Arlington” in bold type. One shirt reads, “It’s not an accident kids from South Arlington are successful!” Fountain worked as a facilities manager in the cultural affairs division of Arlington Economic Development before recently relocating to Austin, Texas. At L.A. Bar (the acronym stands for Lower Arlington) across from Penrose Square on Columbia Pike, the slogan “Keeping yuppies out of South Arlington” strikes a defiant tone. But some county residents view such invocations as counterproductive. “I’ve seen great changes in Arlington as a whole,” says Taylor, the former Nauck Civic Association president, who holds a doctorate from Virginia Tech. He understands the origins of some old resentments, but says he prefers to focus on establishing unity as the county evolves to find its 21st-century identity. 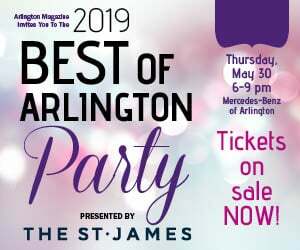 “I personally believe in one Arlington,” concurs David Remick, a resident of the Claremont neighborhood in South Arlington. Now the executive director of the Alexandria/Arlington Workforce Investment Board, he originally moved to Arlington from Boston, where, he says, similar tensions exist between areas like South Boston and the city’s more-affluent neighborhoods. But some say the “south card” still gets played in certain scenarios. A few residents also cried foul when a planned concession stand on Wakefield High School’s athletic fields was missing from the school’s renovation blueprints. The oversight was quickly rectified and the stand was built, but some still saw it as “one more example” of South Arlington getting ignored. “[The concession stand was] one of those things that—oops—fell through the cracks at first,” says Wakefield PTA President Kate McCauley-Balick. Wakefield High School PTA President Kate McCauley-Balick. Courtesy photo. McCauley-Balick lives in North Arlington (Courthouse). Her kids went to Gunston Middle and Wakefield High after completing the Spanish immersion program at Key Elementary. She says her current role as head of the PTA is a testament to her appreciation for the fine education her kids have received at Wakefield. And with a price tag of $118.6 million (one of the most expensive school renovations in state history, according to the Virginia Department of Education), she says one would be hard-pressed to accuse the county of skimping on the school building itself. Similarly, others say the ongoing characterization of South Arlington as economically stagnant is tough to defend when one considers the massive tide of redevelopment that has swept areas like Shirlington, Pentagon City, Crystal City and Columbia Pike in recent years. “I think it’s well on the way to becoming upscale,” says John Van Doren, an arts and antiques consultant and fourth-generation Arlingtonian who has lived in the Bluemont neighborhood since childhood. He sees the persistence of North-South stereotypes as misguided and culturally detrimental. 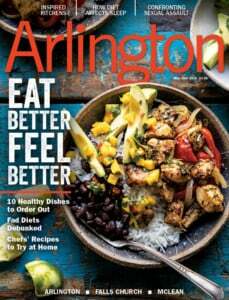 “South Arlington doesn’t mean any one thing to any one person,” he says, noting that the neighborhoods that make up the county’s southern half are as diverse as the people who live there. She introduced herself this way before posing a question about bus rapid transit to Arlington County Board Member John Vihstadt, a guest on the show that day. The problem is, not everyone shares that conviction. And on matters of county politics, perceptions have proven to be just as powerful as the hard realities driving budgets, site selections for county facilities and the allocation of resources. “The county board is not tone-deaf,” Milliken, the facilities planner, says, giving elected officials credit for how they handle the difficult, no-win diplomatic predicaments they so often find themselves in. All of them, save one (Libby Garvey), live in North Arlington. Arlington resident Steve Thurston was the founding editor of ArlingtonMercury.org, which operated for two years. He teaches writing and journalism courses at Montgomery College in Rockville.